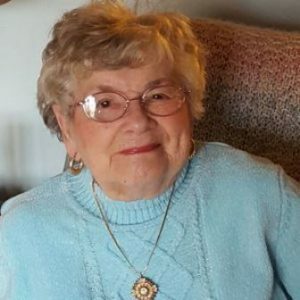 Hudson – Bertha (Lizotte) Church, 96, of Hudson, died Friday, Jan. 12, 2018 at her home, with her family surrounding her. Born in Marlborough, she was the daughter of the late Hervey and Nellie (Mcintyre) Lizotte and the wife of the late Grady O’Dell Church Sr., who died in 1964. A licensed realtor and well known in her field, she was employed by DiTomasso Realty in Marlborough, as well as Durand Realty, retiring in the late 1980s. For the past 40 years, Bertha had enjoyed a special relationship with John Clifford of Charlestown. Although her talents were many, her first love was quilting. She pieced and quilted, all by hand, a quilt for each of her children. She also spent many years installing lighting and furnishing a Southern Colonial dollhouse. Most items were handmade and precise. It was also landscaped and the décor changed with the season. She was accomplished in many areas but there was nothing that made her happier or was more important than her family and friends. She is survived by her sons, Grady O’Dell Church Jr. and his wife Nancy of Boylston and Herve Church and his wife Sandra of King City, Ore.; her daughters, Sandra DeBeradinis and her husband Harry of Hudson, Shelley Casavecchia and her husband Alan of Easton, Mary Church of Chelmsford, and Pauline Church of Boxboro; seven grandchildren; 12 great-grandchildren; and six great-great-grandchildren. She was also the sister of the late Clayton and Raymond Lizotte and Pearl Naughton Gilmartin. A funeral Mass was celebrated Jan. 18 at St. Michael Church of Hudson, with burial at Forestvale Cemetery. Donations, in lieu of flowers, may be made to the American Heart Association, 300 Fifth Ave., Suite 6, Waltham, MA 02451.